I have been visiting the hospital quite a bit lately seeing people from my church. Every time I went, I came away depressed. I realized that I was feeling sorry and sad for the people I saw there. One of the people I was visiting was a charter member of our church who had open heart surgery and then went to ICU for a couple of days. But I did not feel sorry for her. 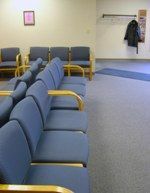 Her grown children were with her, and on the day of the surgery her friends from church filled one whole area of the waiting room. The night before her surgery, around thirty friends from church prayed with her. She knew she was loved. She turned her surgery over to God with confidence that whatever happened would be fine. It made me happy to see that kind of community. Another one I visited was in ICU. He has been there over a week after a heart attack. But I was not sad when I saw him. He too was the recipient of groups that prayed for him. His wife of many years faithfully sat by his bed often with her best friend of over thirty years. He reminded his wife and children that whatever happens, he will be okay. It is inspiring to see faith that does not fear death. His family and friends are all praying for his recovery, but we all too believe that whatever happens, it will be okay. It was the people I did not know that made me depressed and that I felt sorry for. Seeing rooms with patients in them and nobody sitting with them. Seeing one family member all by themself waiting on the outcome of surgery. They must feel alone. Sometimes I can see in their eyes that they envy what my friends have. When I talk to them, they will even say how lucky my friends must be to have that many people that love them and care about them. And that is where I get to tell them they can be part of our family too. If you are part of a community –- a family — of faith, be thankful. You are blessed. Not lucky, but blessed. They will be there for you. They will pray for you. They will bring you food. They will show up. If you do not have that kind of family… you can. I would enjoy sharing how that happens. Write me at steve@hopeforlife.org or join the blog discussion at www.hopeforlife.org. "I Felt so sorry for Them" by Steve Ridgell is licensed under a Creative Commons License. Heartlight encourages you to share this material with others in church bulletins, personal emails, and other non-commercial uses. Please see our Usage Guidelines for more information.